Knoebels amusement park in Elysburg, Northumberland County, consistently makes lists of parks with best wooden coasters especially for its lovingly restored coaster Phoenix. But it will change its skyline with a 98-foot-tall coaster called Impulse. The 2,000-foot-long track will have a chain-driven lift hill, a big first drop and four inversions, including high-banked turns, a cobra roll, a vertical loop and an in-line twist. The coaster will travel 55 mph. The ride, reportedly the most expensive attraction in the history of Knoebels, will be built on a spot now occupied by bumper boats near the park's 110-foot-tall Ferris wheel. The last inverted steel coaster at Knoebels was Whirlwind, a corkscrew coaster with two inversions. It was removed in 2004. Knoebels has built a reputation for restoring and replicating rides that have been given up on by other parks. Since 2011, it's added two unique coasters. In October, Knoebels opened Flying Turns, a replica of a 1930s-era ride designed but never built by renowned coaster designer Herb Schmeck. The bobsled-style coaster was a labor of love and took seven years to build. It features a wooden chute, where a trackless train glides freely like an Olympic bobsled through a twisting course. In 2011, Knoebels moved The Golden Nugget indoor steel coaster built by renowned ride builder John Allen from Morey's Piers in Wildwood, N.J. It opened it as the three-story Black Diamond dark ride and roller coaster. The new rides join the park's two top-rated wood coasters. Phoenix was originally built in 1947 as The Rocket at San Antonio's Playland, which closed in 1980. The ride was dismantled and rebuilt at Knoebels in 1985. 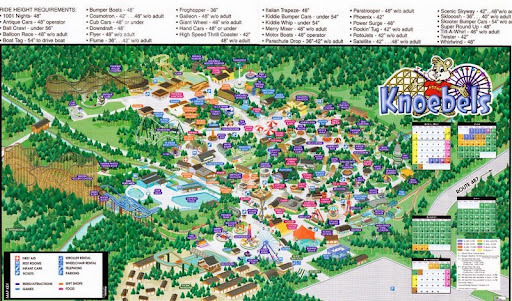 In 1999, Knoebels built its Twister wooden coaster, based on 1964 blueprints for a defunct ride called Mister Twister that also was designed by Allen.